Renewable energy sector is one of the most vibrant industries which have the potential to bring transformations in global economy. Technology improvements, cost effective solution and inclination towards the creation of sustainable environment are supporting the deployment of renewable energy projects across the globe. Solar photovoltaic (PV) cells are the fastest-growing supply source for electricity across the globe. Low cost and technologically advance source of energy makes smart solar technology an attractive opportunity for policy makers and industry players who are looking for improving energy security by diversifying the supply and reducing the environmental impact. Wind and solar power are expected to make a critical contribution to meeting the ambitions of the Paris Agreement. Their contribution to power systems around the globe is rapidly moving from marginal to mainstream, including in emerging and developing countries. In 2016, around 1.8% of the total world electricity consumption was fulfilled by solar PV and is expected to witness massive growth in the near future. This growing demand for cost effective solar energy is contributing in the growth of smart solar technology. Government is also spending in new projects for the deployment of new solar PV. For instance, in 2010, Indian government introduced National Solar Mission plan and aims to generate 20 GW by 2022. Israeli government is also embracing solar energy and is investing in research and developments for the deployment of residential and commercial solar energy power station projects within the country. Such initiatives by government are contributing in the expansion of smart solar technology market across the globe. 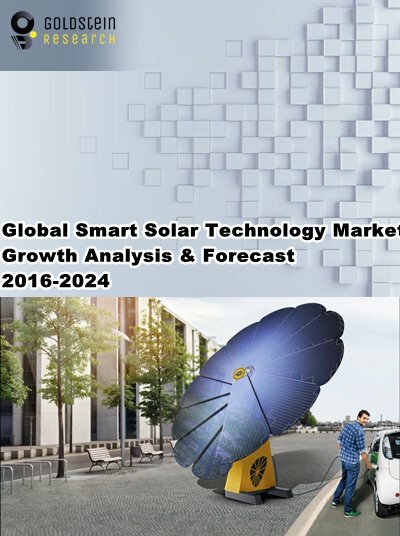 Global smart solar technology market valued USD 6.4 billion in 2016 and is anticipated to grow at a CAGR of 17.4% during the forecast period, owing to the increasing adoption of smart solar systems for power utilities across the globe. Global clean energy investment, including renewable energy recorded over USD 330 billion in 2016 to support the deployment of new renewable energy projects. Global solar PV capacity increased from 5GW in 2005 to a nearly 306.5 GW in 2016. The United States is estimated to occupy nearly 4% share in global solar import market. Lack of domestic manufacturing capacity is limiting the market share of the United States for smart solar technology market. However, countries such as Japan, India, Chile, France, China, Turkey, Brazil, Mexico and El Salvador are the largest solar export market and are expected to bring new business opportunities for smart solar technology market over the forecast period. By the end of 2020, France is expected to increase its solar energy capacity up to 2.29 GW whereas in 2016, Germany solar PV capacity reached more than 41 GW. However, emerging economies such as Africa and Sub-Saharan countries are facing challenges in the expansion of smart solar technology market due to lack of strong infrastructure, which is inhibiting the integration of renewable energy technologies in these countries. Over 600 million people in Africa region do not have access to reliable power source. High investment for maintenance and low conversion efficiency are hindering the growth of the global smart solar technology market. Moreover, data management and smart solar device replacement are also likely to inhibit the growth of smart solar technology market. However, rising deployment and adoption of smart grid technologies in order to meet the energy requirement and management are anticipated to fuel the global of smart solar technology market during the forecast period.